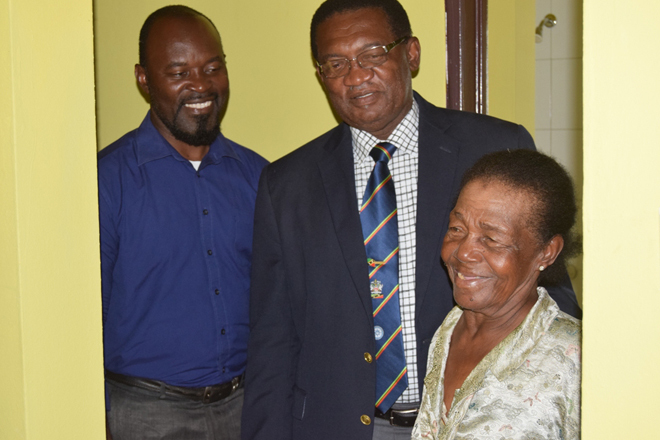 (SKNIS): Glendora “Baby” Daniel was handed the keys to her new home in Lower Hermitage, Cayon, on Thursday, September 28, by the Chairman of the Board of Directors for the National Housing Corporation (NHC), Valentine Lindsay. 80-year old Ms. Daniel worked in the sugar industry for some 47 years, which qualified her for assistance from the Team Unity Administration. Minister of Human Settlement, Honourable Eugene Hamilton, explained that the administration had determined that some persons who served in the sugar industry for most of their lives and found themselves living in poor conditions would be given assistance. “Glendora Daniel is one such person. I’m not sure if you have seen the photograph or the picture of where she was living, but if you see that you would recognize it was important for the Team Unity Administration to do something for Glendora Daniel. This property is an NHC property. So are a few more around the country owned by NHC, which is not being passed on from family to family. That is important for you to understand. It houses persons like Glendora until they are passed on and it will then be transferred to someone else who find themselves in a position like Glendora,” Minister Hamilton said. General Manager of NHC, Mrs. Elretha Simpson-Browne, recalled when the minister visited her in her office and told her of his commitment to help Ms. Daniel. “He said to me that he made her a promise that he would assist her and he asked us to deliver, hence we’re here today. So I would like to commend our Minister of Human Settlement, the Honourable Eugene Hamilton, for taking such a keen interest in the living conditions of our residents…,” Mrs. Simpson-Browne said. She also thanked the board of directors for providing the required approval for the house. “I want to say to Glendora, Glendora we’ve given you a place where you can live the rest of your days in comfort,” said the NHC manager. Ms. Daniel was then given a tour of the house along with members of her family who were present for the handing over event.